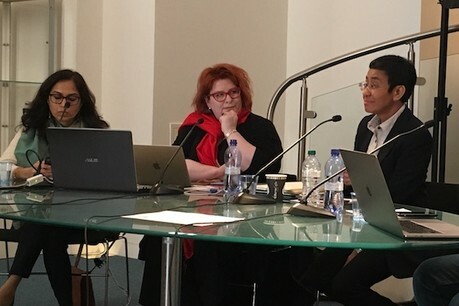 From left: Ritu Kapur, Julie Posetti, and Maria Ressa, speaking at IJC in Perugia in April 2019. Ever since 2016, when President Rodrigo Duterte assumed power in the Philippines, Maria Ressa, CEO and executive editor of news website Rappler, has been living under threat. Earlier this year, Ressa was arrested twice in what were described as politically motivated attacks on free speech. Ressa and Rappler were repeatedly verbally attacked by President Duterte for their investigative reporting on the bloody state-run campaign against illegal drugs. "What we did would be impossible without the internet," said Ressa, speaking at the International Journalism Festival in Perugia (6 April 2019). However, wider digital outreach also meant Ressa and her colleagues were the subject of threats of sexual and gender violence, especially after President Duterte publically called Rappler 'fake news' two years ago. Simply 'not feeding the trolls’ had no effect on stopping the onslaught of abuse so the journalists had to find another way to fight back. Leveraging their community activism model, the team started an online campaign #NoPlaceForHate to educate audiences about online civility. "I was very naive," Ressa recalled, adding that she underestimated how systematic the abuse would be and how widely the social media had been weaponised against journalists. In a bid to bring the fight to online threats and trolls, Rappler started collecting data on its abusers in a database dubbed ‘the shark tank’ which tracked their online activities. This allowed the website to respond more efficiently to what it identified as a state-sponsored disinformation campaign. "This is a battle for truth which then attacks trust. And that goes to the very heart of what we do as journalists," said Ressa. "I was ashamed of getting attacked even if I knew it was wrong. Speaking out has been liberating." Talking about fighting disinformation campaigns in India, Ritu Kapur, CEO and co-founder of Quintillion Media, said that the millennial English- and Hindi-speaking audience of the Quint needed a different approach. "We found that many young voices were seeking a platform to speak about topics that mainstream media are blocking out," she said. "We also needed to fact-check and respond to fake news that proliferated online." The publication launched a project called WebQoof - a spin on the Hindi word bevakoof which means ‘moron’ - and which loosely translates as someone who believes everything they see online. "We also realised that the use of WhatsApp is massive and misinformation is spreading way too fast," said Kapur. To tackle that, the Quint team asked the readers to send them any suspicious content for fact-checking. "We put out one call to action and we received a deluge of requests over the next three days," said Kapur. This is how the Quint started collaborative fact-checking with its audience because the team could not deal with all the queries alone. In both cases, the community of readers came together to help their news website double down on public interest stories. Both publications rely heavily on social platforms, predominantly Facebook, for content distribution and audience development. "The community is getting stronger, but gets its strength from our ability to push back," commented Maria Ressa. "So you have to be strong. "We can’t solve this problem on our own. Tech companies have to step in but they are keeping silent. "Regulation alone can’t solve online harassment of journalists. Unless tech platforms come on board, media and human rights organisations are powerless. "You need to fight back every day because the day that you remain quiet may be the day that they will think you’re wrong," concluded Ritu Kapur. To learn more about this topic, check out the Lessons in innovation: how international news organisations combat disinformation through mission-driven journalism report by the Reuters Institute for the Study of Journalism and the University of Oxford.